Lighting of the corresponding indicator lamp on the instrument panel confi rms the selective switching on of the lighting selected. Depending on the version, the instrument panel may have permanent back-lighting. In this case, illumination of the instrument panel is not linked to the exterior lighting. C. fog lamps selection ring. The fog lamps operate with the dipped and main beam headlamps. To switch on the foglamp, turn the ring C forwards. 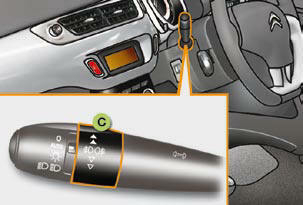 When the lighting is switched off automatically (with AUTO model), the foglamp and the dipped headlamps will remain on. To switch off all of the lighting, turn the ring C rearwards. Turn the ring C forwards once to switch on the front foglamps and twice for the rear foglamp. Turn the ring C rearwards once to switch off the rear foglamp and twice for the front foglamps. When the lighting is switched off automatically (with AUTO model) or when the dipped headlamps are switched off manually, the foglamps and sidelamps will remain on. Turn the ring rearwards to switch off the foglamps, the sidelamps will then switch off. In good or rainy weather, by both day and night, the front foglamps and the rear foglamp are prohibited. In these situations, the power of their beams may dazzle other drivers. Do not forget to switch off the front foglamps and the rear foglamp when they are no longer necessary. When the ignition is switched off, all of the lamps switch off automatically, unless "guide-mehome lighting" is activated. If the lighting is switched on manually after switching off the ignition, there is an audible signal when a front door is opened to warn the driver that they have forgotten to switch off the vehicle's lighting, with the ignition off.